Ever since watching Essiebutton's Weekend Morning Routine, I have been obsessed with the defined-crease eye makeup. It's such a great way to give some 'natural' definition to your eyes. So what is a defined crease? As the name suggests, it means your only eye makeup is some subtle definition in the crease of your eye. This creates the illusion of deeper and bigger eyes. 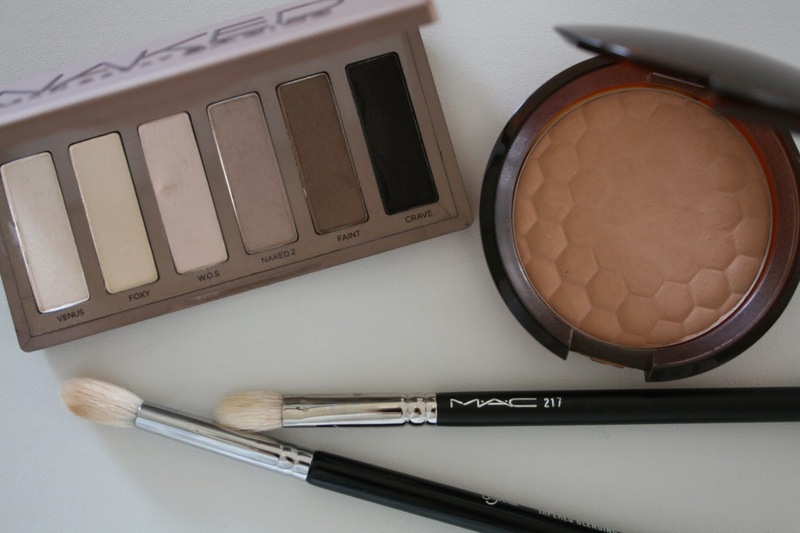 Products - The key is finding the right matte contour shade for your skin. For me that's a light to medium brown. The Urban Decay Naked Basics Palette (£22.00) is great for this; I mix Faint and Naked 2. Another product I love is bronzer: I use The Body Shop Honey Bronze in 03 (£13.00). Tools - To easily create this look, your best friend will be a fluffy brush with quite a defined tip. I usually grab my MAC 217 (£18.00) or its Sigma dupe the E35 (£15.00). This little trick takes you less than a minute, but it makes such a difference to your overall look. Have you tried this out? What are your favorite products?